Although only small, there are some great places to eat. The fabulous Small Holdings offer delicious brekky, lunch and dinners,that are ever changing and deliver beautiful rustic style food and local wines. Bookings are highly recommended. There is also a cute little pizzeria housed in old horse stables. Malmsbury is now home to a fabulously new and interesting café called Motobean. It is a calling card for vintage car lovers, great food eaters and anyone who enjoys relaxing on a Sunday afternoon with a cool jazz band and a couple of drinks. This cute little town offers a couple of a number of galleries and little shops. The famous Malmsbury bakery offers great bread and pastries if you have a craving for a country pie. Within only a 10minute drive you will discover there a few little local boutique wineries that may take your fancy. Perhaps grab a local bottle of vino and some cheese and head for the Malmsbury Botanical gardens, one of the oldest gardens in the Macedon Ranges. Lovely, peaceful and scenic, it’s a great place to lay in the sun. Piper Street, with its well renown restaurants that constantly bring tourist from Melbourne just to have a meal. You will find great quirky shops and galleries here as well. Maybe just enyoy a coffee and cake at one of the many cafes. 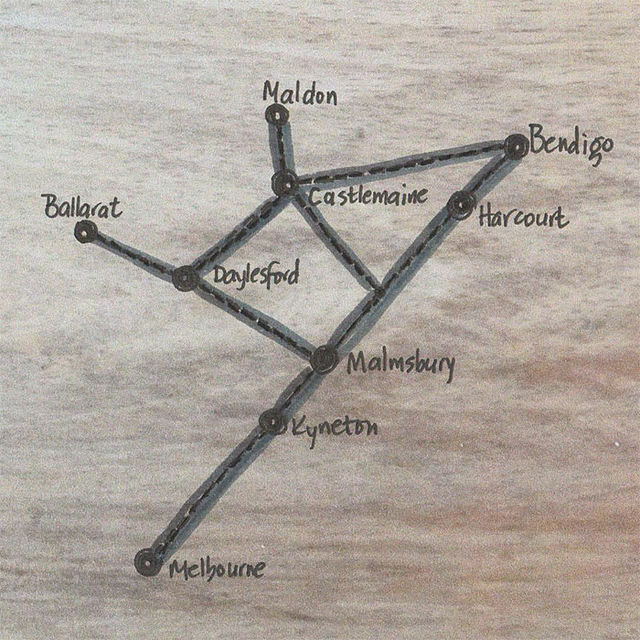 Castlemaine and Daylesford, although in opposite direction are both only a really short 20 minute drive away. Both these towns boasting many a great eateries, shops and galleries, there won’t be enough time in the day. With Daylesford being well known for its day spas and relaxing treatments, you may want to put a massage or hot spa on your list of things to do.